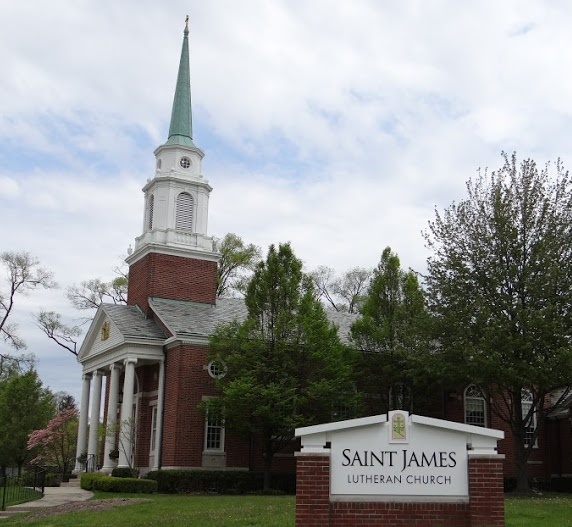 Eucharist is celebrated each week, and all people are welcome to commune at Saint James. Children are always welcome in worship. There is a dedicated area for our youngest worshipers in the front left of the sanctuary, near the double doors. For those who prefer, a staffed nursery is also available each week for children up to age 3. An usher will be happy to direct you. Parking is available at the municipal lot to the east of the church. On Sunday mornings parking is free, and at other times, a stamp is available to validate the tickets. Please see an usher or member of staff for assistance. Additional parking is available on Sunday mornings at the Richard School lot to the west. Restrooms are located on the main floor (same level as the entrance to the municipal parking lot) on the way to the gathering area, and can be reached from the sanctuary by going through the double doors to the left of the pulpit. Please contact Pastor Grant for membership inquiries.